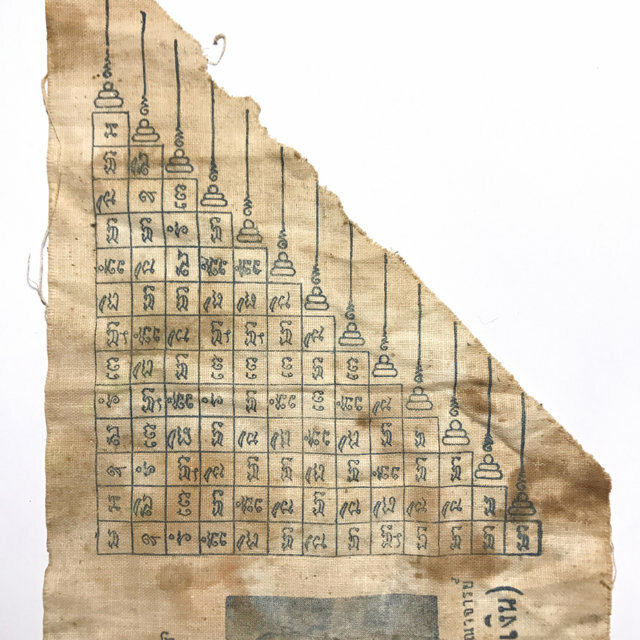 Pha Yant Tong Chai Luang Por Ngern (Mid Era) 14 x 25 Centimeters Guru Monk Victory Flag Yantra Cloth of one of the Great Monks of the Wat Don Yai Horm Temple Lineage, whose Fame and Merits are revered around the nation and the world. 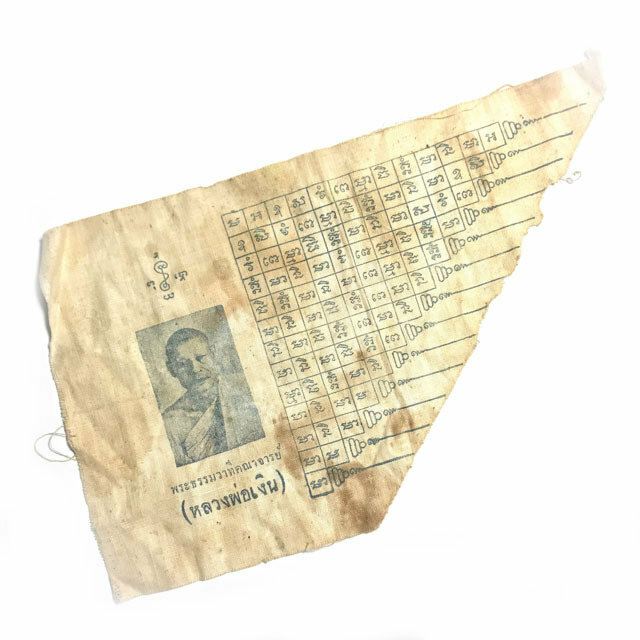 The Pha Yant was blessed by Luang Por Ngern at wat Don Yai Horm during the mid era. 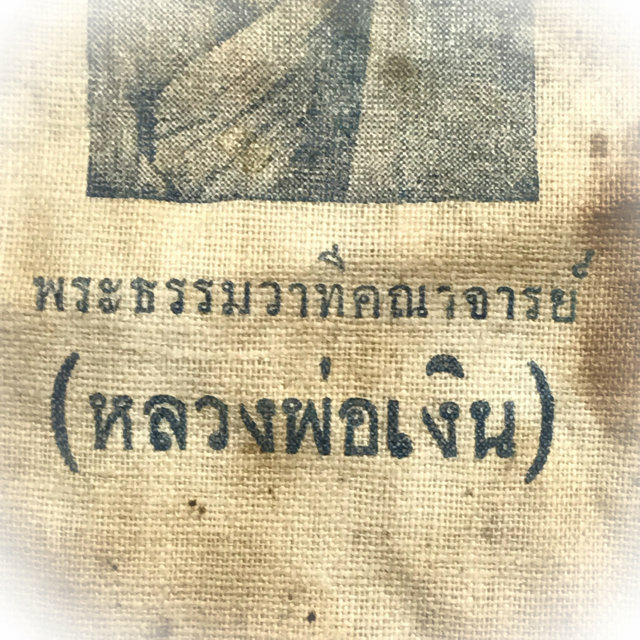 The Pha Yant bears a Yant Tong Chai Victory Flag Yantra with 13 Buddhas, and the image of Luang Por Ngern. Luang Por Ngern lived from 2433 BE - 2520 BE, was ordained in 2453 BE, and became Abbot of Wat Don Yai Horm in the year 2466 BE. Luang Por Ngern was one of the great Olden days Masters, who was the Kroo Ba Ajarn of the Great Luang Por Chaem, who was the Abbot of Wat Don Yai Horm who came after Luang Por Ngern, at Wat Don Yai Horm. 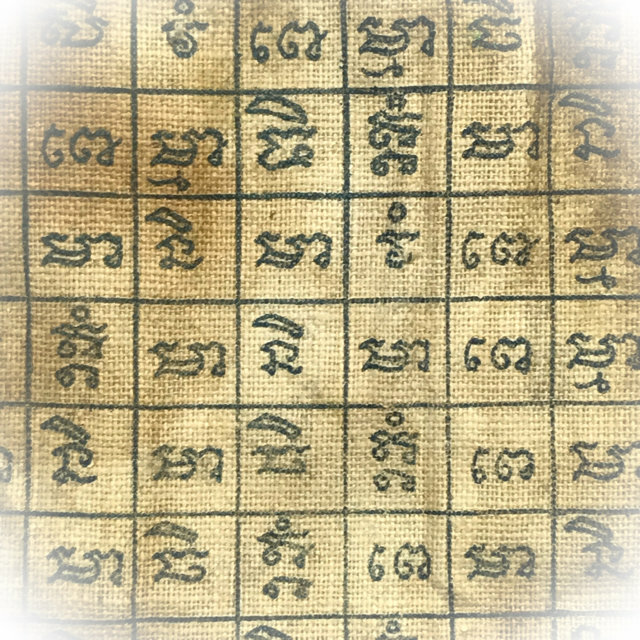 The Pha Yant Tong Chai is a Powerful Yantra for Success and Victory in one's Endeavours, and for Protection, Auspicious Blessings, Anti Black Magick and Karma Improvement. 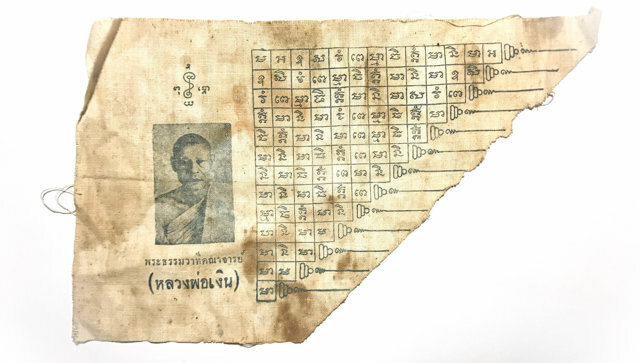 Luang Por Ngern made many official amulet editions, but also made many talismans and charms, not all of which are documented in the official temple releases, for of course, he would also make individual amulets for his closest Looksit to Bucha. 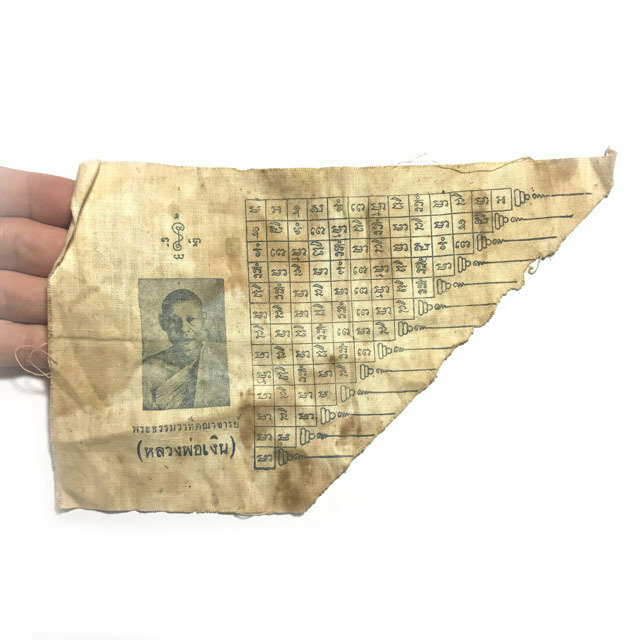 This Pha Yant is included in the 'Dtamniap Wadtumongkol' Official listings of Luang Por Ngern's amulets, making it very easy to study and authenticate, which also increases its status and value. Luang Por Ngern was the previous Abbot of the temple of Wat Don Yai Horm, before the Great Luang Por Chaem, who continued after him. uang Por Ngern was the Abbot of the temple of Wat Don Yai Horm in Olden Days, before the Great Luang Por Chaem, who continued after him. Apart from this it was of course first and foremost the spiritual centre of the community, and the place where people received Dhamma teachings, and learned how to meditate, pray, and chant Kata. 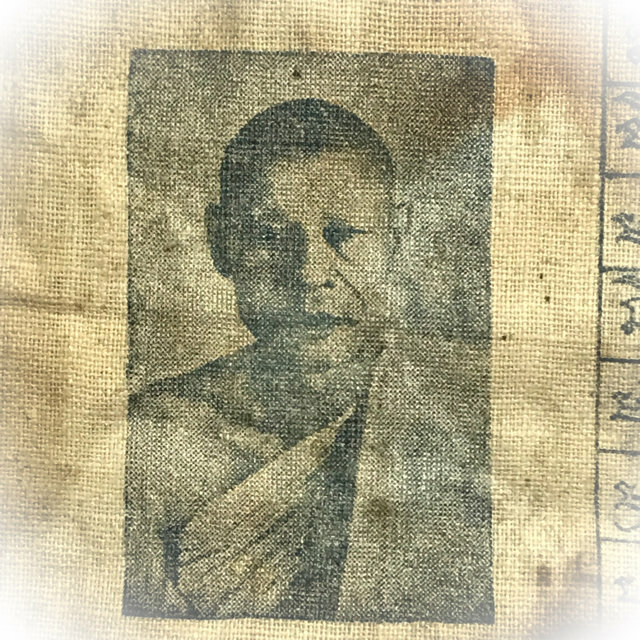 Luang Por Ngern was renowned for his meritorious attainments in both restoring and developing the temple facilities, providing education in the form of schooling for children, and medical treatment for the poor, and was a great source of comfort to those who came in desperation to seek spiritual consolation. This is the reason why he was called 'the Angel of Wat Don Yai Horm'. Luang Por Ngern was also extremely renowned for his high level of Patipatā (Practice of Restraint as an Ordained Bhikkhu within the 227 Rules of the Buddhist Vinaya Pitaka Canon), for his leadership in guiding the local devotees towards the right way to practice. He was just as well renowned and revered, for diligently and tirelessly developing the temple and its annexed facilities. He built many Public Buildings for the benefit of the Local Folk, in order to alleviate their sufferings. Even though Luang Por Ngern is long since passed on to the next world, the people of Nakorn Pathom province still pay respect and revere this Great Monk for his great Merits and Metta, and the selfless deeds he performed, and public facilities he built for the local folk, and his memory is as alive today, as it was during his lifetime.